French seams are something I get several emails about. 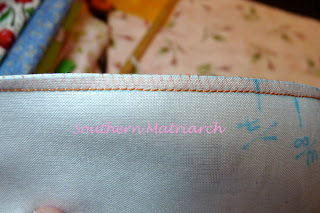 For some reason a French seam is something that is intimidating for some sewists. They don't need to be. Like many techniques from sword swallowing to basting, everything is better with practice. If you are not happy with a technique, then try to be more careful each time you try it until you get the results you want. Let me know how that sword swallowing goes. 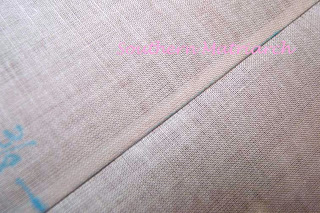 Here is a French seam in 13 pictures or less. (As always, click on the pictures to enlarge.) To begin with I will demonstrate this on a scrap of batiste found languishing on my sewing machine table and glaring orange thread. The fugly thread is so you can see what I am doing. This is the technique I learned from Lyn Weeks and is demonstrated in her book "Precise and Professional." 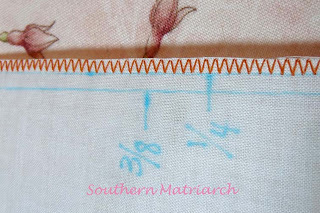 I use a 3/8" seam allowance for almost all of my French seams. I find I have more control both in hand and on the machine. NOTE: If your pattern does not call for a 3/8" seam allowance, alter your pattern before cutting. 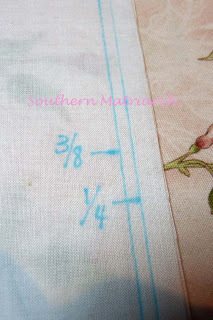 I mark both the 3/8" and the 1/4" seam allowances. 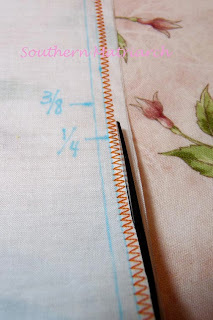 Make it a habit to mark both seams until you are familiar with your machine. I still mark mine most times. I find it quicker to mark than rip out. I will stitch the first pass on the 1/4" mark with a zig zag stitch. My machine settings are 2.1width and 0.9 length. 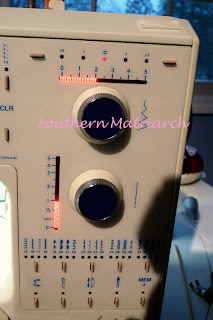 With wrong sides of the fabric together, using a zig zag foot on my machine, I begin stitching making sure that the left hand swing of the zig-zag hits right on that 1/4" mark. Stitch the seam. This is my first pass. Again this is wrong sides together. 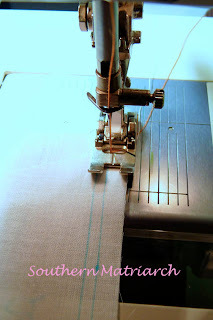 Set your zig zag seam with the iron, or as Lyn calls it, meld your stitches. This helps your stitches sink down into the fabric. The next step is scary, I trim right up to those zig zag stitches. I use these black Dovo scissors (featured in this post) to do this trimming. 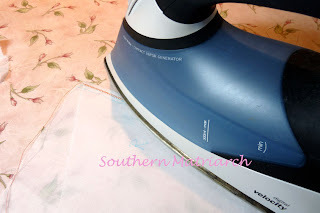 They have a serrated blade and have very good control when trying to trim a narrow seam allowance on wispy fabric. 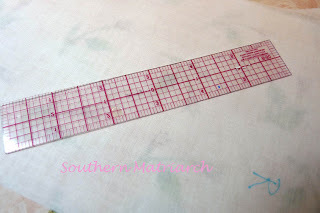 If you will carefully cut with a light, steady pressure, it feels like you are cutting perforated paper as your scissors snip into the holes made by the right swing of the zig-zag stitch. First pass of a French seam, trimmed. Close! Next press this seam to one side from both the wrong side and the right side. Now fold your seam, right sides together. This is the folded edge. 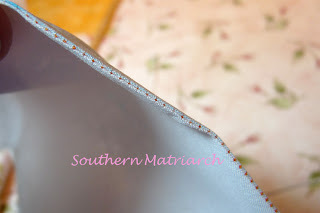 You want to make sure the edge of that first seam is at the top of your fold. Otherwise you get a pleat in your finished seam allowance. That is not the look you are going for, and it will also take up more fabric into your seam allowance. Resulting in a seam that could be more than 3/8". Do this enough times and you can alter the fit of your finished garment. I have changed to my edge joining foot and picked up my trusty bamboo skewer. If you enlarge the picture you can see that my skewer is marking a little gulley in my fabric right on that blue 3/8" line and is skimming right along side the left edge of those previous zig-zag stitches. This allows my blade on the edge joining foot to sew right in that little gulley. Thus making a tiny neat seam. Second pass of the French seam. 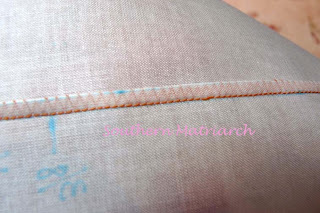 As you can see the first run of stitches are encased inside the finished seam. Making a strong, neat seam. Press this seam flat as it was sewn to set your stitches. Open the fabric, press to one side on the wrong side first. Then press on the right side. Tidy, tiny seam every time and not a fuzzie to be seen! Don't let a French seam scare you off! I've been using French Seams for ages, never like this. Today I will apply this tutorial as I am making a bishop. Thank you, thank you, thank you! What a great tutorial. I actually had to resort to french seams earlier in the week when my serger quit working, but I was just winging it. I did use the same measurements you used so I guess I was doing something right! LOL!I didn't use the zig zag stitch. I will do that next time, should there be a next time... And you crack me up with the rulers! Black market dealing rulers, who knew!? LOL! Thanks for the tutorial. I just bought an edge stitching foot. I've never used the zig-zag on a french seam, so now I have two things to try. I love teeny French seams -- and now everyone knows how easy they really are! They really make the wrong side of our sewing as beautiful as the outside! I use French seams on most of my children's garments. I had never thought of doing the zigzag step. Is that to just make a neater, staighter, flatter seam. I love French seams. You have such a gift for explaining techniques!!! You are the best... I never can find the camera, or the plug to fit it to the computer.. I will say that using the lightening stitch on my Viking will get even tinier french seams that will work well with a bishop. That was a GREAT tutorial! Thanks "sew" much for posting it! 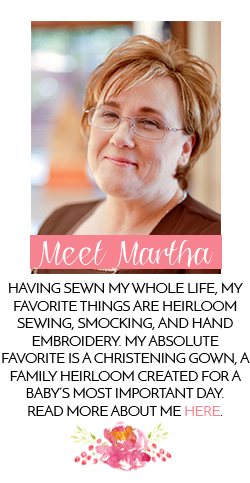 Excellent as always Martha!!! I also love French seams!!! Very interesting and helpful tutorial! 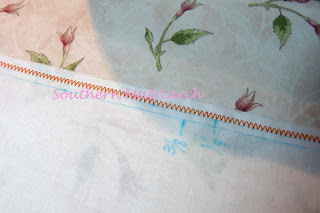 I love French Seams, but I have never done zig zagging for the first pass. I will try it and see how I like it the next time something calls for French Seam. just wanted to give you a cyber hug and tell you I love you and I wish I lived close so I could sit at your feet while you sew... I mean that with all sincerity! I've had a frustrated evening of sewing and I need me some friend time. 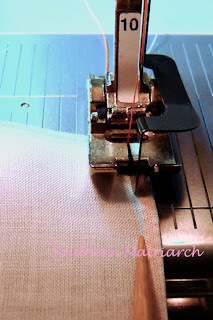 I never even knew a french seam existed...and now I"m excited to try it out! This is my go-to! It works perfectly EVERY time. Makes me happy. LOVE this tutorial! So much better than the way I was taught.